list of colorful and stylish jewelry made with dice. for jewelry or read below for information on how to make your own. you don't find what you're looking for on this page. 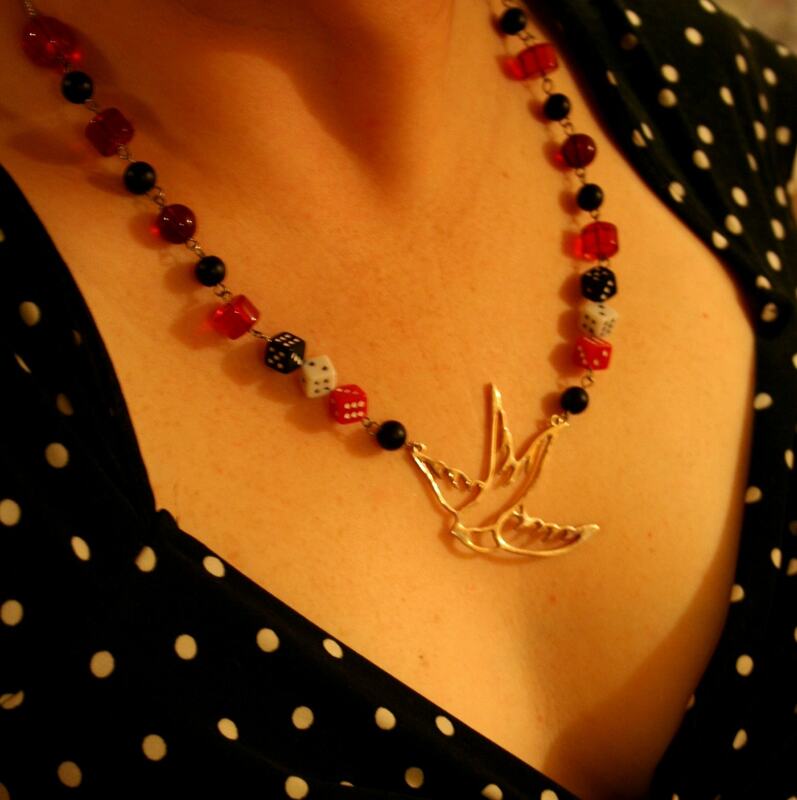 There's one word that can help you track down more dice jewelry: BUNCO. jewelry, apparel and other dice themed products too. I'll also recommend the "World of Dice" and ETSY web sites to you. They specialize in stylish, affordable jewelry crafted from dice. World of Dice also sells a line "game ready" dice jewelry in case you need to remove the dice to play a game. To make life easier, you can also use a custom dice jewelry search engine located at the bottom of the page. If you'd like to make your own jewelry -- like dice bracelets, dice necklaces or earrings -- you've come to the right place. First, you need to choose your favorite dice from a variety of dice beads. Next, you need terrific instructions and information on how to make beaded jewelry. Now, you can use your imagination to create beautiful dice jewelry to wear...or to give as a Christmas present or a birthday gift! Novelty dice rings are a fun accessory to own. The dice rings are adjustable and sold in a variety of colors for under $10. You'll find a variety of colors and styles of dice earrings. Lucky 11 dice jewelry, a popular brand specializing in dice jewelry, offers a great selection. Below, you'll find a beautiful pair of dangling green dice earrings. red opaque and red transparent dice earrings. Try a pair of small hot pink dice earrings to add color and fun to your style. Why by one set of earrings when you can get three? You can buy a set of three silver dice earrings for a great price. Each set has different dice colors. Unlike the dice bead necklaces tossed around Mardi Gras, these dice necklaces are more elegant and tasteful. In most cases, the necklace contains a single die or a pair of dice, such as Lucky 11's cherry red dice necklace. Lucky 11 offers the same style necklace with a variety of colors and images, including: clover green dice, pink skull dice, black and red horseshoe dice, green horseshoe dice. 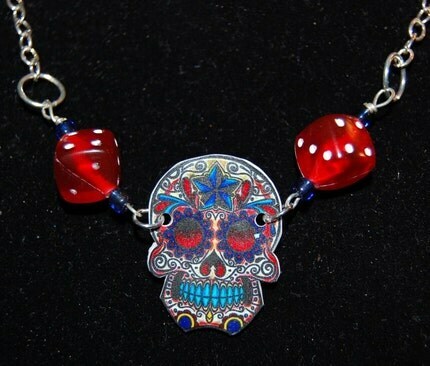 Here's an artistic, rockabilly style skull dice necklace. Its design was inspired by tattoo designs featuring the Mexican Day of the Dead. 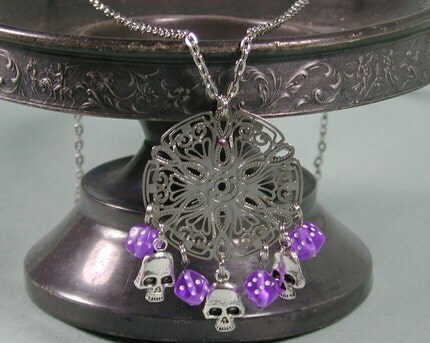 If you like handcrafted, funky jewelry, then look at this metallic necklace with silver skulls and purple dice. If you want a black dice necklace, there's a black iron cross dice necklace. You can also get the same necklace with red and white iron cross dice. Like hearts and dice? Then the sacred heart necklace will delight you. There's a gold dice charm or a beautiful silver pendant to accentuate any style of dress. Crystal Caste jewelry offers a great variety of pendant necklaces (and earrings) based on the d20 (20 sided) dice. 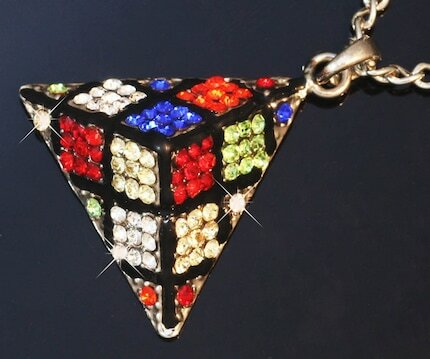 Fans of the Rubik's Cube Dice will enjoy this colorful crystal dice necklace. You've got some decisions to make with the variety of colors available in dice bracelets. Most of the bracelets are a circle of dice in one color, like the cherry dice bracelet. You'll find other solid colored dice bracelets with your favorite colors and images, like the black iron cross bracelet, black skull bracelet, green clover dice, hot pink,white dice with rose, red skull, and white pearl. You can click here to browse the "How Cool" web site for these bracelets. Alternating colors are also a popular choice. Color combinations include: pink and white, red and white with iron cross, black and white with iron cross, and, last but not least, the red and black dice bracelet. Click here to browse for these dice bracelets. Finally, there's a different style of bracelet available too. The dice jewelry charm bracelet has 4 dice with links of chain between each. Is it time to get your belly some bling? Belly rings are the dice jewelry that will accentuate your tummy in style. Is 7 your lucky number? If so, the lucky seven dice dangle belly ring from Body Candy will be your lucky charm. There's also a yellow dice belly ring or try a black dice belly ring, if you're looking for a more formal color. You're dressed to the 'Nines' and need that extra finishing touch. 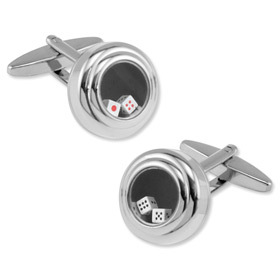 You need dice cuff links to complement your swanky, cool Las Vegas style. Inexpensive novelty dice cuff links are also available. For under $10, you can find them in a variety of colors. 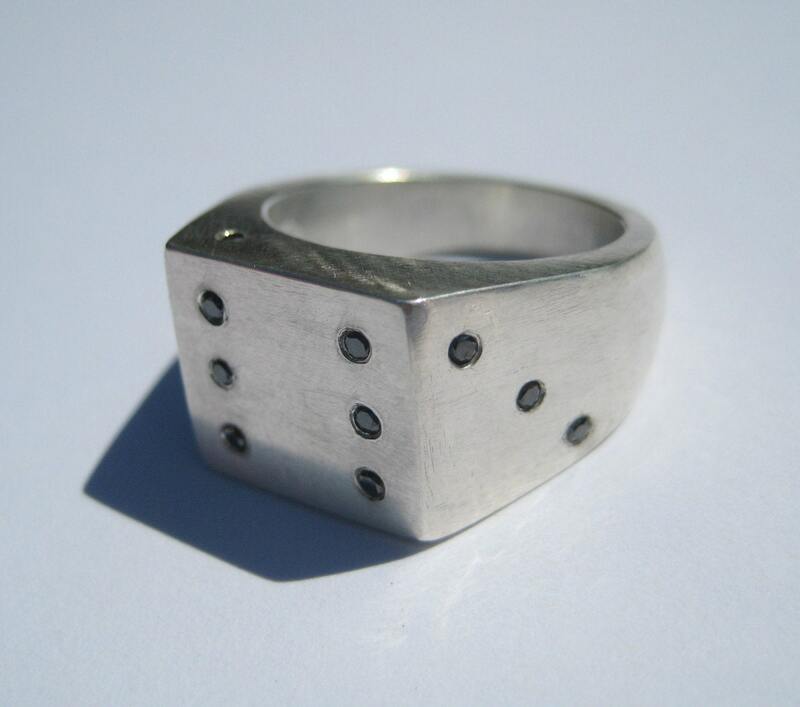 Black diamonds set in sterling silver create the look of a solid, stunning dice ring. The custom search engine below will help you. It will deliver results from numerous sites that offer dice themed jewelry. Many of the jewelry pieces on this page come from these sites. Type in your search term below and get results fast.